"Historians need to be aware of the problems that our colleagues in science, engineering, and the social sciences are working on, so that we know what evidence to seek out for the benefit of addressing those problems. And our colleagues in the STEM fields need to read history as avidly as they read about the present. We cannot imagine a biologist ignoring the fossil record. Ignoring human history is no different." As MIT works to advance solutions for global challenges in the realms of innovation, education, environment, and health, MIT’s School of Humanities, Arts, and Social Sciences (MIT-SHASS) has tapped key scholars and researchers to provide insight into meeting these challenges from a wide range of disciplinary perspectives. These stories and interviews are collected in The Human Factor Series. 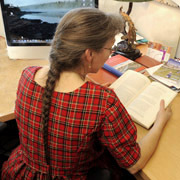 Professor Anne McCants is a historian whose research projects span multiple centuries of European economic development. The author of Civic Charity in a Golden Age: Orphan Care in Early Modern Amsterdam (1997), and articles in the Journal of Economic History, Economic History Review, and Social Science History, among many others, she has worked for decades to better understand the standards of living in the past and those features of the economy that contribute to social welfare. In 2004, she was named a MacVicar Faculty Fellow for exemplary and sustained contributions to undergraduate education at MIT. She served as the head of the MIT History from 2006 to 2012. Recently, MIT-SHASS Communications asked McCants to share her thoughts on some of the broad questions related to innovation and economic opportunity. In the same way that cosmology and geology (the two historical sciences) have been absolutely critical to most important developments in science — for example, we depend on the fossil record, the tectonic record, and the cosmic record for much of the evidence necessary for the study of everything from biology to theoretical physics — so too the study of history provides the accumulated evidence of how human systems function, and more importantly thrive. History matters because without a credible story about where we have been before, we truly have no idea where we are now. And without evidence about past sequences of cause and effect, it is well-nigh impossible to develop intelligent plans for the future. Moreover, it is not sufficient to say, “Well then, let’s just study the important things from the past, but not all that trivial stuff that distracts so many historians.” Unfortunately, humans are notoriously bad at knowing in advance which things will turn out to be important. To take just one simple example, we now know that conditions of gender equity, especially female education, are critical to economic development. Yet for centuries it did not occur to anyone to record what women did, let alone study that. Q: What has your extensive experience as an historian of economic development taught you that can help in the process of making tools that can enable anyone to innovate? Economic history viewed on a very long timescale tells us that innovation and population size/density are highly correlated. The mechanism here is easy enough to imagine. Great ideas often emerge serendipitously, and more people represent more opportunities for such moments. Once one person has a good idea, many can go on to benefit from it, so there is not the per capita diminishment of good ideas the way there is for a field of grain, for example. Broadly then, innovation has been greatest in places where there are many people. However, economic history viewed on shorter time horizons tells us that population size alone is not enough. Rather, it is in populations where lots of people are both permitted and capable of “having a go,” to quote my colleague Deirdre McCloskey, where innovation thrives best. What allows people to have a go? Two conditions are critical: 1) being accorded the social dignity to speak their minds and pursue their own goals; and 2) access to the human capital that allows them to achieve their full potential. Both of these factors are severely limited by rigid systems of hierarchy and by the conditions of poverty. In her medieval history classes, McCants shows students that the quality of a society’s cultural production is profoundly related to its economy; and that potential genius can be nurtured by a healthy economy, or stymied by extremes of inequality and poverty. Hierarchical systems depend on keeping people in their “place.” And for the majority, being in place means a priori not having a go. Poverty works its damage through the second mechanism, namely it sabotages human capital in a process that starts at birth, indeed even before birth. If your mother is nutritionally deficient or immunocompromised during your gestation; if you are born with a low birthweight; if your protein intake in infancy and early childhood is too low to support your inherited growth potential; if you ingest lead or other toxins from a contaminated household environment as a toddler; if you are not exposed to a rich human vocabulary long before you can read; if your home is plagued by insecurity of multiple kinds so that your own response is the early and frequent production of an abundance of stress hormones; we know from detailed medical, economic, and historical research that all of these conditions un-level the playing field long before the “game” as we typically measure it even begins—that is, before you head off to school, take your first exams, participate in your first sports, or try to form your own first relationships. So, the tools needed for anyone to be able to innovate have to start with programs that mitigate the terrible (and multiplying) effects of poverty, especially on the youngest members of our society. And we have to create the social conditions that allow everyone the full human dignity to try and have a go. Q: What economic, sociopolitical, or cultural issues do you think most need to be addressed to make progress toward the global economic goals MIT has identified? We would go a long way to addressing our goals if we put a real priority on child homelessness, child hunger, child exposure to environmental toxins, child poverty, the emotional neglect (or worse) of children, and prenatal and childhood access to preventive health care. We fret endlessly (as we well might) about the quality of our schools, and admission to and curriculum in our universities. Yet we too rarely talk about the damage that social exclusion and economic inequality intermingled with absolute poverty do before children come anywhere near such institutions. Q: What is the key barrier you see to multi-disciplinary, sociotechnical collaborations, and how can we overcome it? In a way, all humans are historians. Every decision we make is framed on the basis of what we believe to be true about the past. The key, of course, is for us to be good historians, knowing true and useful things about the past, or at the very least having a method that explicitly seeks that as its goal. All of the disciplines benefit then by working alongside history, to increase their stock of evidence on which to draw, and to ensure the validity and reliability of that evidence. How do we make such working-alongside happen? That, it seems to me, requires hard work on both sides. Historians need to be aware of the problems that their colleagues in science, engineering, and the social sciences are working on so that they know what evidence to seek out for the benefit of addressing those problems. And the others need to read history as avidly as they read about the present. We cannot imagine a biologist ignoring the fossil record. Ignoring human history is no different.